Bad credit history? We could find you an affordable Second Mortgage! If you have been refused credit or only offered expensive finance elsewhere because of a poor credit history, then apply online now for a decision on a loan within an hour. We have worked closely with our trusted lenders to specially develop products that can provide you with the finance you need, when you need it - whether for consolidation or another purpose. You could be very surpised at just how affordable our rates are compared to other finance options available. Apply online now for a decision within an hour and see if you could be one of the 51% of customers that get a rate of 16.4% APRC variable or lower! If you have a bad credit history, CCJs, Arrears or have recently missed repayments we could still help you get an affordable loan. Consolidate other credit with just ONE low monthly repayment and you could reduce your outgoings by £100s each month. 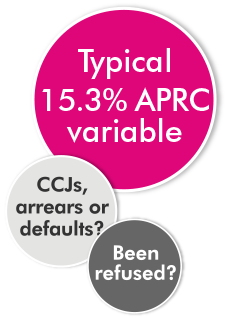 At least 51% of customers receive a rate of 16.4% APRC variable or less. With a Second Mortgage you can choose a plan that suits your finances. You can pay it off quickly or extend the term to reduce your monthly repayments – either way you are in control.